We’re getting excited. Another milestone in State Theatre history is about to be reached. For the first time, the State Theatre Company’s annual fundraising gala will be held at the State Theatre rather than at an off-site location. 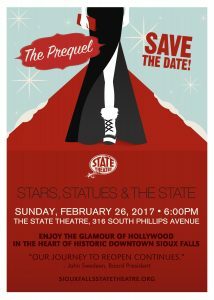 The fourth annual Stars, Statues & The State event will be held at the downtown landmark at 316 S. Phillips Ave. The fun will begin at 6 p.m. Sunday, Feb. 26. Enjoy the glamour of Hollywood in the heart of historic downtown Sioux Falls. Stars, Statues & The State will feature a live telecast of the 89th Annual Academy Awards Show and a silent auction. The event will be catered by Chef Dominique and include desserts from CH Patisserie. Valet parking will be available, and we’ll shovel off the red carpet. Attendance will be limited to 300 people. We expect the black tie event to sell out. Tickets are available online for $125 per person. Marcie and Patti are co-chairing the event. People who attend Stars, Statues & The State will see that auditorium area remains under construction. Tremendous advances have been made in recent years in preserving and restoring the historic theatre, which opened in 1926 and closed in 1990, but the job is not finished. After restoration work has been completed, the State will reopen as a multi-purpose facility for community events such as films, artistic performances, business conferences and social gatherings.